Students in educational plans may work together on the same publication (it may be an assignment, a coursework, or any kind of publication). The owner of the publication should invite other users from the same account (Edu Class, Edu School or Edu Campus accounts) to collaborate. 1. From My Publications page open the publication and click the Edit Settings button of the issue you wish. 2. 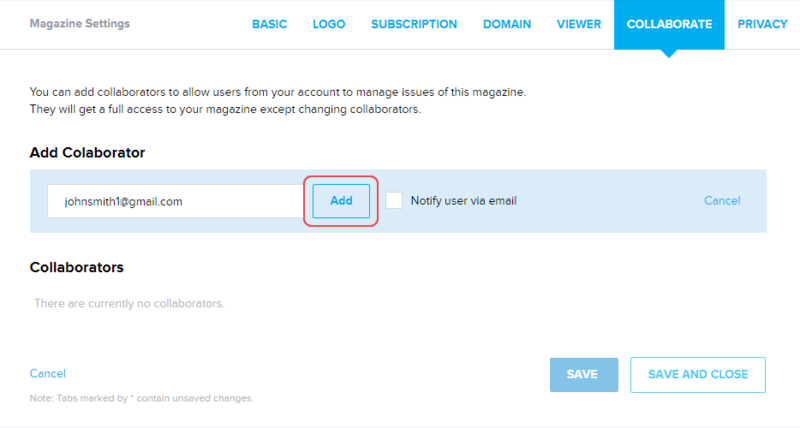 Go to the COLLABORATE tab and enter the user's email allowing him/her to manage issues of this publication, after that click the Add button. 3. You can add as many users as you wish by repeating the last step. Note: This feature is currently available with our Educational Plans.